I know, I haven’t write anything in my blog the past three days, but I had a short trip with my family and we had a great time! As you can imagine, being by the sea it is not something that lets you to chat or do anything in internet. So here I am again with a sweet full of vanilla aroma recipe from a great lady, a wonderful mama… The pink mama!!! My name is Anne and I blog over at The Pink Momma. I’m a stay-at-home Mom to a 16 month old little girl. Besides blogging, I enjoy cooking, baking and crafting as well. I’m also a freelance cake decorator and you can check out all of my creations on my Facebook page called Anne’s Little Pink Shoppe. I also have an Etsy shop called Little Miss Athena which I made handmade hair accessories. I’m such a busy mama! Haha! Anyway, I would like to share a delicious cupcake recipe. One of my favorite, vanilla cupcakes. Preheat over to 350 degrees F (177 degrees C). Beat eggs and sugar until fluffy using an electric mixer or a hand mixer. Add eggs one at a time and beat in vanilla extract. In a separate bowl, mix the flour, baking powder and salt. Alternately add the flour mixture and alternately add the milk. Fill the cupcake pan or a muffin cup with the cake batter and bake it for 17-20 minutes. The cupcakes are done when you insert a toothpick at the center and it comes our clean. Let it cool in a cooling rack. Frost it when it’s completely cooled. Cream the butter until smooth using an electric mixer or a hand mixer. Add the vanilla extract and gradually beat in the sugar. Add the milk. If you want a colored frosting, tint it with your desired color. This recipe makes about 12 cupcakes. Voila! 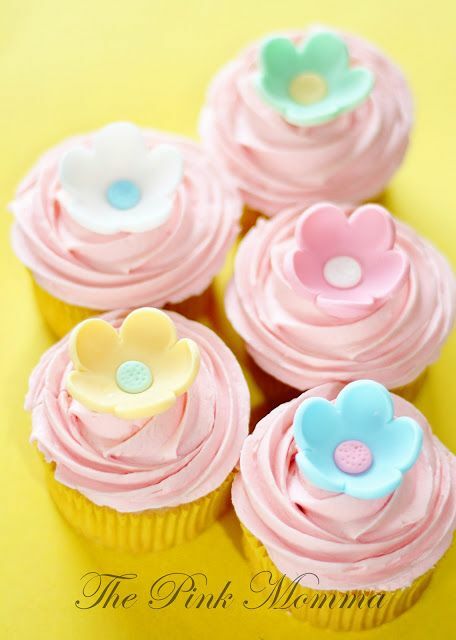 You are ready for a cupcake party! Don’t forget to stop by my blog. Every Friday I’m hosting the Fun Friday Blog Hop and would like to invite everyone. I’ll see you there 🙂 Thank you so much Zina for having me. wow!!! they look so delicious! I will have to try them! Thank you both for sharing!